Where is Bob? : In search of the BIGGBY WAY? So I'm sittin' here gettin' reports from the office and I notice that BIGGBY COFFEE is up again for yesterday(+8.7% same store sales) and (+5.3% cup count)....course all this is a little internal jargon for more people are comin' to BIGGBY COFFEE than ever! This in spite of the fact that the Michigan economy has been in a virtual recession since 2001...and clearly the National economy is in a tailspin too. Now, I know a lot of business people...and yet I don't know anyone that can report this kinda' customer loyalty, I also know a lot of people in the Foodservice business, and they they aren't talkin' about people knockin' their doors down either, and even the big hitters in the Coffee Industry are reporting that things are way down...What's up with that? Why could BIGGBY COFFEE be growing? What is it? But if so, what is this elusive thing, called the 'BIGGBY WAY'? I think the BIGGBY Way is to enjoy good coffee in a casual and fun atmosphere. 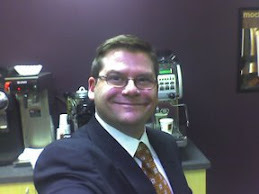 I love to go and just hang out with friends at the BIGGBY near me! This makes sense, BIGGBY COFFEE is the best and when you are in the stores can feel the energy and enthusiasm of the customers and staff. Awesome to hear! 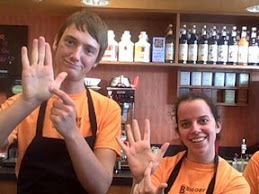 To be honest, so much of the BiggBy Way is the employees. I am always greeted with a smile and a laugh, jokes are reciprocated with, and the atmosphere is incredibly friendly. Biggby Coffee isn't a product, it's a service. You're not selling coffee (though that is the physical object the customer receives) you're selling the atmosphere and experience. Of course sales are up! People are coming into the shop because it brightens up there day. It's a depressing(recessing?) world right now and people need a smiling face. which after the video, we are all clear on that business..
is anyone up for trying to get that in the Webster? We love and appreciate our customers, I hope they realize they make my day as much as I hope we make their day!!! "enough with the negative vibes"
I know the reason I keep going to Biggby is because they have the best coffee outside of my hometown coffee shop, The Shay Station, and they maintain the feel of a small local coffee shop. Also helps that they have great coffee drinks, an awesome selection of fantastic beverages, and spectacular staff. I think it's due to the fact that Bob's just a huge RAY OF SUNSHINE. For us it is a lot about the customer service, not just getting what you want in a timely manner, but how the staff interacts with you as a customer. We have at least 6 cafe choices, just in the downtown area of Ann Arbor, and more when you move out to the surrounding area. Being a native to this city it is nice to have a place to go and they know who I am, although I think they knew Nigel's name before ours, we don't feel that we are lost in the mix of temporary residents (called students). It's from Kelly's Heroes, Donald Sutherlands character. I do have to admit, I did have to cheat and look it up. If I could have heard it said, though, I think I could have got it--Kelly's Heroes is in my collection, dang it all.